"What is the best Korean BBQ in Los Angeles?"... This is the question that my friends ask me a lot when they come to visit Los Angeles, CA. Short answer, it is "Kang Ho-dong Baekjeong" in my opinion. Its dishes such as beef, pork, soup, Kimchi, Japchae are really good and it'll be hard for you to find the main item that isn't good here. By comparing to other Korean BBQ restaurants, sometimes their beef is good, but their Kimchi is just okay or vice versa. 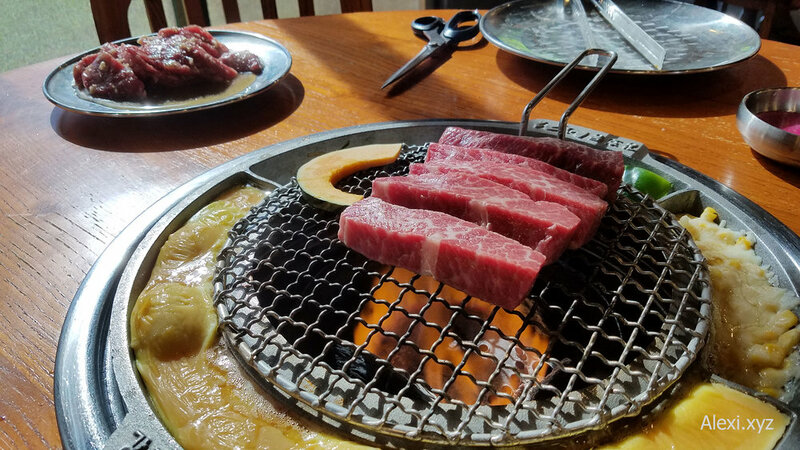 Also, servers at Kang Ho-dong Baekjeong are the ones who grill the meat for you, so you just focus on eating and enjoy all of the side dishes on the table. Beware, sometimes an inexperienced server may not cook the meat to its perfection. Kang Ho-dong Baekjeong offers both beef and pork for the BBQ. There are a variety of beef that can be ordered, such as prime boneless short rib, prime beef belly, prime rib eye, thinly sliced brisket, outside skirt, beef tongue, beef tartare, and etc. (I really like the prime boneless short rib the most.) Also, Bibimbab, tofu soup, Japchae, dumpling, pancake, cold noodles, ramen, and etc. are offered here. The price is reasonably at ~$30 per person. The beef combo's price is ranged from $59.99 (for 2-3 people) to $98.99 (for 4-5 people). The pork combo's price is ranged from $51.99 (for 2-3 people) to $87.99 (for 4-5 people). If you go with à la carte, the beef item is costed from $24.99 to $37.99. The pork item is around $26.99 per item. The only major different between Kang Ho-dong Baekjeong and Ahgassi Gopchang is that Kang Ho-dong Baekjeong doesn't offer beef intestine, while Ahgassi Gopchang has beef intestine menu items.